Hey, everyone, it’s time for another author interview, but this time around I present to you Dean Calusdian, who recently released his first graphic novel, The Stocking Dead. Dean, tell everyone a little about yourself. I’m a freelance artist, playwright, a stage director and filmmaker. I like to try a little bit of everything. My artwork has been on such divergent things from record album covers to olive oil bottles. The Stocking Dead. What’s it about? It’s “Night of The Living Dead” meets “Rudolph The Red Nosed Reindeer.” On Christmas Eve a zombie plague spreads throughout Christmasville turning the residents into flesh eating fiends, and small band of elves fight to survive. After years of doing haunted houses, and being known for creepy art, I had tried something new by creating a large walk-through Christmas display. After two years, and the occasional observation that my Christmas display was still more creepy than cute, I decided to try something new. So purely for the fun of it, I started The Stocking Dead. I had no real intention of ever publishing it, it was more of an exercise to just spend several hours drawing every day. I know you’ve been working on The Stocking Dead for quite a while now. How long did it take you to complete it? Over three years. At least a year to write and pencil it, another year for inking and a year to color. Did you do all the art by hand or did you have some digital help? The pencils and inks were done traditionally on 11x 17 bristol paper, then those were scanned and the coloring was all done in Photoshop. You’ve employed a rather tongue-in-cheek marketing campaign that’s so far included fake billboards and Stocking Dead pogs. What’s the thinking behind that? I don’t know if my funky marketing campaign will actually yield sales, but it’s a lot more entertaining for me, than to keep posting “Buy my book! PLEASE!” I’m actually having a great deal of fun creating a campaign that is its own ridiculous (and mostly fictitious) adventure. I have a really hard time with self-promotion, so inventing “Stocking Dead Central” and their terrible marketing and public relations divisions was much easier for me. For the print edition, why did you choose to have a large quantity of hard copies printed rather than use a print-on-demand approach? Unlike a novel that’s completely prose, the on-demand printing costs of a 116 page fully illustrated color graphic novel are super high. It was about an average of $16 a copy, and that’s before any type of mark up. Although I’ll be living with boxes upon boxes of graphic novels, ordering a huge amount of offset print editions was the only way to make it affordable for the consumer. We currently have a cover price of $11.99. How can people get their hands on a print edition? Currently you can order it from Amazon, or direct from us at StockingDead.com. 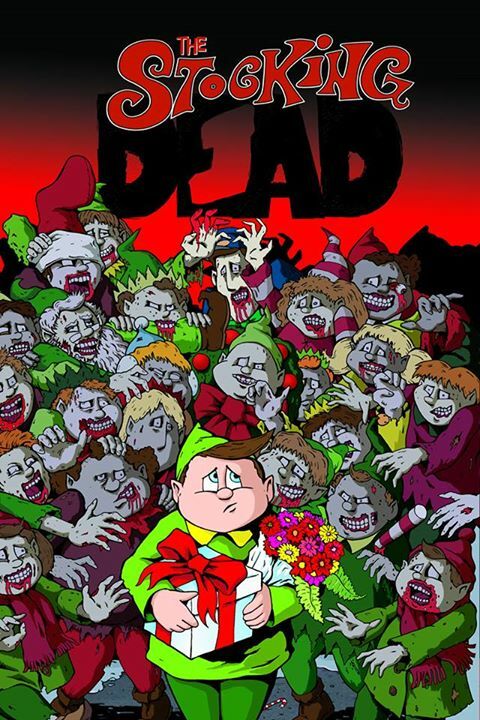 The Kindle version is also currently available (right here: The Stocking Dead ). The coolest of comic stores will be carrying it. We’ll also be selling it, along with some of my other artwork at SuperMegaFest in Framingham MA, and RI Comic-Con. Is this a one-time project, or do you have another graphic novel in your future? Right now this is a one shot deal, if it’s successful maybe in another three years we’ll do our follow up book…World War X-Mas. Secret Origins – 99 Cents! Pasts Imperfect – On Sale Next Week!